1 night at Hilton Sandton hotel- JohannesburgAll flights, porterage and tips, mineral water, laundry, telephone or any other expense personal in nature. Personal Insurance, we strongly suggest that the passenger‟s take out there own insurance before departing for South Africa. at Cape Town International Airport, UNIQUE TOURS representative meets you for a transfer to your pre-booked hotel. 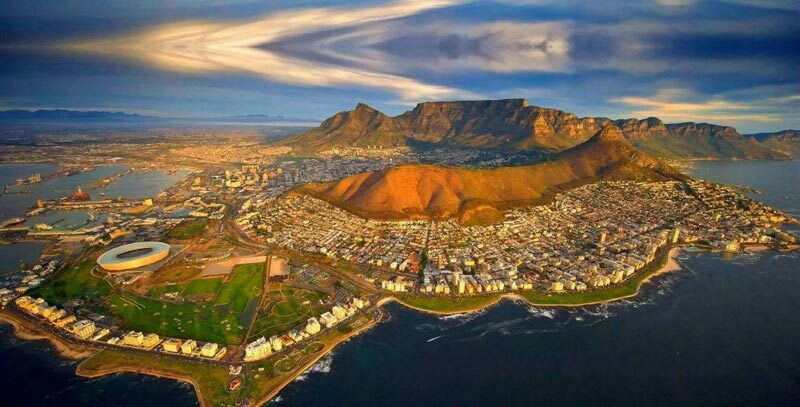 This comprehensive tour shows you the best of the spectacular Cape Peninsula and why it is it's called the Fairest Cape. Travel past Sea Point and Camps Bay, past the famous beaches of Clifton and Llandudno towards Hout Bay. Drive along the Atlantic Seaboard. Pass through Noordhoek and Scarborough. Later you will take to the Cape of Good Hope Nature Reserve. Enjoy the funicular ride aboard the “Flying Dutchman” and enjoy the unforgettable spectacular views. Grand-West Casino. Overnight at hotel. After breakfast you will transfer to Knysna and go on a cruise on the vast Knysna Lagoon. After breakfast leave for Oudtshoorn. It is known as the „Feather Capital of the World‟ thanks to its huge ostrich industry. Later in the afternoon you will enjoy game drive. After breakfast you will take a shuttle and transfer to Sun City. After breakfast transfer to Johannesburg. Accommodation in standard rooms in above or similar on full board basis. Dinners at Indian restaurants & lunches will be non-Indian like Italian Pasta / Pizza etc. All transfers & sightseeing on Seat-in-a-coach basis in an air conditioned luxury vehicle.